The frequency of dividend payouts matter, especially if you want to reïnvest on a regular base. Time has shown over and over again that regular investing neutralises the big drops and highs in the market. 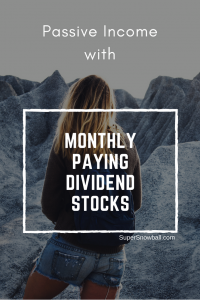 But if you have been following the Super Snowball investment strategy for some time you already know how we leverage the momentum of dividend cashflow. 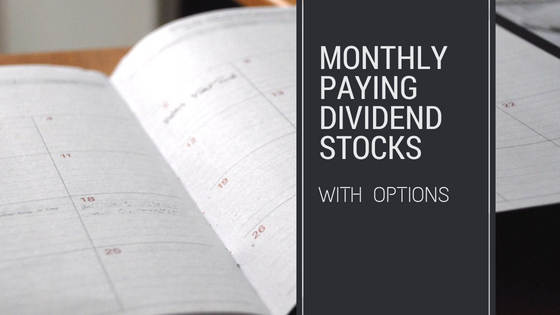 Having monthly dividend payers in our portfolio gives us way more flexibility to write options at expiration dates of our choosing. Here you can find the complete list of US and Canadian Stocks that pay monthly dividends AND if they have options listed on them. Little note: There are some closed-end funds listed on the stock market that also pay monthly dividends, I will be listing them in a separate post.